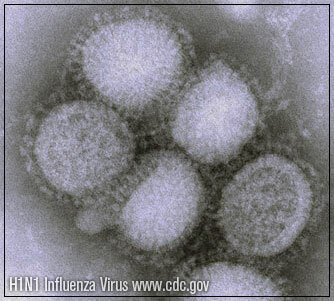 H1N1 "Swine Flu" influenza virus as photographed through a powerful medical microscope (Centers for Disease Control and Prevention CDC image). Wash your hands frequently and properly HOW TO: CDC recommends that you wash your hands vigorously with soap and warm water for 15 to 20 seconds before rinsing and drying with a clean towel. The time it takes to sing the "Happy Birthday" song twice is about the correct time to spend scrubbing the hands together. Remember: Regular bar soap doesn't kill most germs, viruses or bacteria — lathering up water and soap only makes the skin slippery so the buggers can't hold on as well when we try to rinse them off. Sneezing properly, coughing etiquette HOW TO: Many experts recommend placing your hand on your chest, raising your elbow to your mouth and sneezing into your elbow area to absorb the germs (never sneeze or cough into your hand because your hand transfers the germs to everything you touch. Likewise, sneezing into the open air spreads your germs everywhere). Remember: Avoid touching your face with your hands unless you just washed them properly because hands are the number one way germs are spread to the eyes, mouth and nose (which is why it is important to keep clean hands). COUNTY OF SAN DIEGO INFORMATION ABOUT SWINE FLU INFLUENZA H1N1 includes Children and Schools, General Info, Prevention, Medical Professionals in San Diego County, Statistics, News Releases, K-12 Schools, and great public service-type articles like: "When should a child go to the Emergency Room ER?" The above official San Diego County website includes links to local government and private health facilities, the Top 10 Things You Should Know About H1N1 in the County of San Diego, including emergency phone numbers, hospitals — from San Diego call 211 on your telephone for live infomation and help with general information. In an EMERGENCY try to remain calm, and dial 911 for help. FLU.GOV offers a wealth of up-to-date official facts news and popular resources about H1N1 including a Flu Shot Locator to find where to receive flu shots immunization against influenza. The federal CENTERS FOR DISEASE CONTROL AND PREVENTION offers a great "Questions & Answers" regarding the latest news, statistics, information. Includes HOW TO TALK TO YOUR KIDS ABOUT H1N1. The CALIFORNIA DEPARTMENT OF PUBLIC HEALTH offers a free H1N1 resource for state information about the disease. CALIE journalist offers Prevent Swine Flu—Good Advice from the Southern California American Indian Resource—SCAIR. RETURN to the CALIE MEDICAL SECTION.